Blue whales are giant ocean wanderers of Southern and Northern Hemispheres. They are adapted for rapid, long-range movements between feeding areas that may be hundreds of kilometres apart, or feeding and breeding areas thousands of kilometres apart. Their cruising speed is around 20km/hr. They are a very large, slender and streamlined whale. The single ridge on the top of head (called a rostral ridge) leads back to a prominent blowhole with a splashguard – seen in photo below left. Their small dorsal fin, set well back on the body, enhances the impression of a very long back. Their grey skin is mottled with pigment patterns, but they appear aqua-blue when seen underwater. On their underside, longitudinal pleats allow the throat to expand massively as they engulf huge mouthfuls of krill – seen in photo above right. They are the largest animal ever to live on earth! The maximum length recorded for a female Antarctic blue whale (the sub-species of blue whale that feeds in Antarctic waters), was 33.5m which is as long as a Boeing 737. The maximum adult weight recorded is 190 tonnes, equivalent to approx. 38 African elephants! The pygmy blue whale, the sub-species commonly seen in Victorian waters, reaches 24m in length and 150 tonnes. Blue whales may live for about 90 years. Newborn blues weigh between 2.5 and 4 tonnes and increase in size by 30 times in their first year of life. 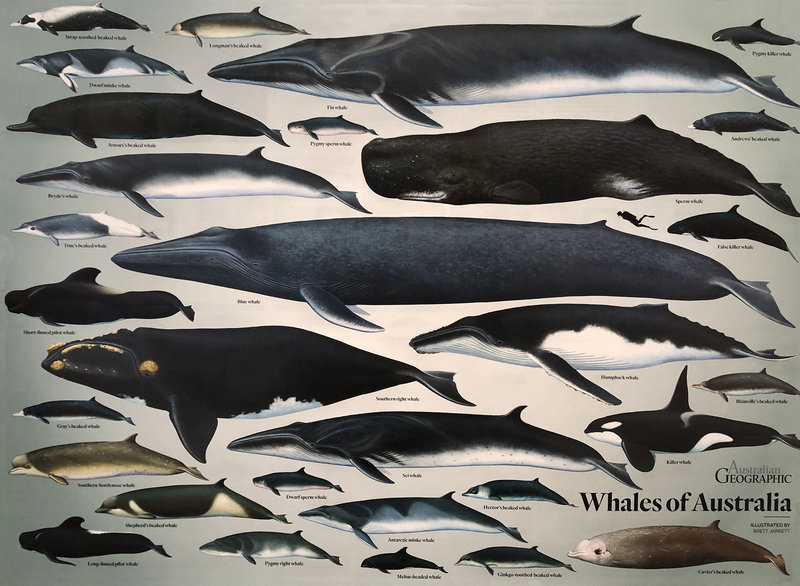 They belong to the rorqual (groove-throated) group of baleen whales (which includes Minke, Bryde’s, Omura’s, Humpback, Sei and Fin Whales). Their jet black baleen plates can be up to 1m in length. Blue whales feed by gulping large quantities of krill. Estimates suggest that a blue whale weighing around 80 tons needs about 2 to 3 tons of food a day, which equates to millions of krill (Nyctiphanes australis) in one day. They are capable of diving up to 500m in depth when feeding, but usually feed in depths between 40-200m in the Bonney Upwelling. As specialist krill feeders, worldwide blue whales are usually found in upwelling or frontal zones with high productivity, such as the Bonney Upwelling. Even in these productive areas, krill are patchy in their distribution. Blue whales search vast areas in search of krill ‘hot spots’ , and upon finding them, they will remain to feed until this resource is exhausted. We now think that if blue whales find a food resource that is far greater than the needs of an individual or small group, they will use their low-frequency calls to ‘call in’ their companions. Researchers call this ‘reciprocal altruism’, where favours will be returned. Blue whales make the loudest sound of any animal, with their low-frequency calls being detected more than 1000km away under ideal conditions. Colour: Silver-grey to grey-black with mottled patterns used to identify individuals. Appears pale blue or aqua when submerged. Blow pattern: Blow is powerful, tall and straight, in calm conditions may exceed 20m and be heard 3 to 5km away. Antarctic Blue Whales Baleanoptera musculus intermedia breed and calve in warm water (north of latitude 20° S) during the southern hemisphere winter. They then migrate to cold Antarctic waters (60 – 70° S) during the southern hemisphere summer to feed on krill. Pygmy Blue Whales B.m. brevicauda occur only in the southern hemisphere (southern Indian Ocean, eastern South Atlantic Ocean and western South Pacific Ocean). They do not migrate as far south as Antarctic Blue Whales, and in summer are generally found north of latitude 55°S. They migrate into Victorian and South Australian waters between November and May where they feed on krill that thrive in the nutrient-rich waters of the Bonney Upwelling (Gill 2002, Gill et al. 2011). Historical whaling and sightings data show that pygmy blue whales may spread out to feed through an immense area of the Southern Ocean, including the productive Sub-Tropical Convergence not far to the south of Australia (Garcia-Rojas et al. 2018). 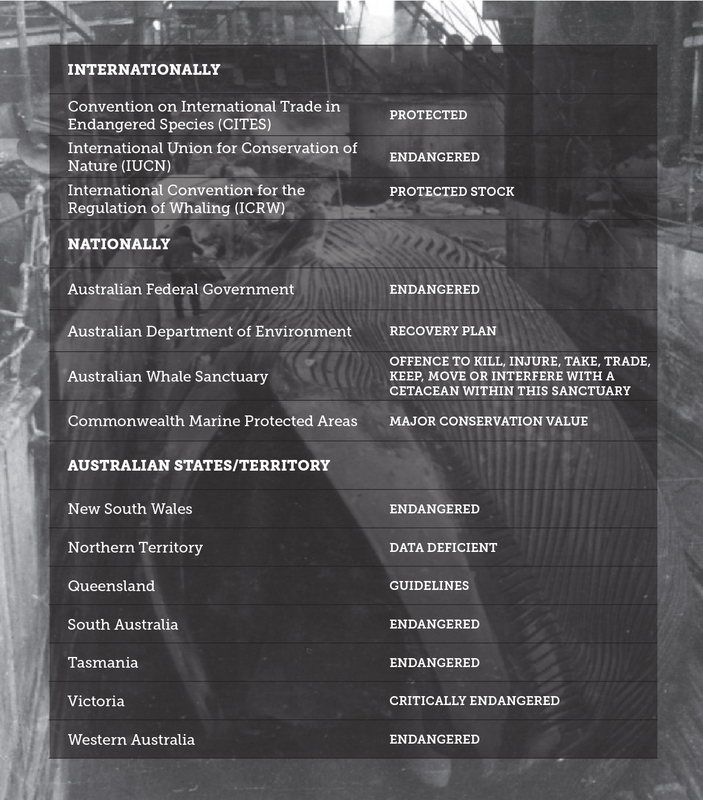 For more information about blue whales, see the Commonwealth Government’s blue whale species profile. Gill, P.C. 2002. A blue whale (Balaenoptera musculus) feeding ground in a southern Australian coastal upwelling zone. Journal of Cetacean Research and Management 4(2): 179-184. Gill, P.C., M.G. Morrice, B. Page, R. Pirzl, A.H. Levings and M. Coyne. 2011. Blue whale habitat selection and within-season distribution in a regional upwelling system off southern Australia. Marine Ecology Progress Series 421: 243-263.